TECNI is committed to sourcing from UK manufacturers wherever possible. We design many of our components in-house and then work with approved suppliers in the United Kingdom to ensure material and finished product quality meets our extremely high standards. We then verify the products before receiving them into our factory using material analysis equipment and calibrated load testing equipment. The products are then sold as DIY parts or assembled by our skilled workforce into wire rope assemblies for applications as diverse as Formula 1 to garden design. “TECNI is genuinely passionate about your projects; the drive to help design and supply a creative solution for a your project is what keeps us motivated. We will always seek to understand the influencing factors for every project we are involved in, so that we can truly understand your needs. However large or small your project is, we believe that successful projects are created by good communication and collaboration and high end quality products. To that end we are committed to supplying premium quality, defect-free products and provide a best-in-class service to every individual customer, no matter how large or small to meet or exceed their expectation. TECNI Ltd (the ‘Organisation’) aims to provide defect free products to our customers on time and within budget. The Organisation operates a Quality Management System that has gained BS EN ISO 9001: 2015 certifications, including aspects specific to the provision of wire rope products and lifting equipment supply, service and inspection (TECNI Ltd). 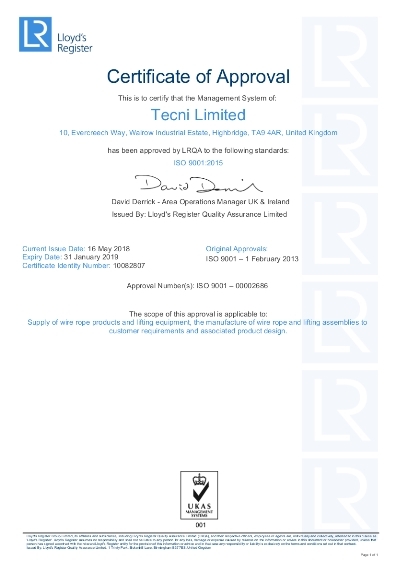 TECNI Ltd is a BS EN ISO 9001:2015 approved company (Registered Company No. LRQ 4007492). We take pride in the fact that our products will last in service, and are designed for long term usage. We only use ISO:9001 registered suppliers and suppliers with alternative recognised quality systems. Our manufacturing processes and procedures, as well as the quality of our cable and wire rope end fittings are continually monitored, quality checked and improved in line with our LRQA approved ISO9001 Quality Management System. All materials are fully traceable and our TECNI stainless steel wire rope can be supplied with full mill certs if required. As distributors of World-Leading manufacturers of Lifting gear, eg Crosby, Tractel and Columbus Mckinnon (Yale etc) all our lifting quality products are supplied with a manufacturer's EC Declaration of Conformity. TECNI’s mission is to make premium quality wire rope products, cable fittings and tools available to everyone backed up by first class customer service. Our extensive range of premium quality products are offered at realistic prices and delivered quickly. We don’t have a minimum order quantity or value. TECNI fittings are in the main easy to put together on site, however if you want us to make bespoke assemblies to your design and specification, test and mark your fittings then we can do that too, making the process as easy as possible for you. With many years of experience between them our knowledgeable Sales team work closely with you to establish your requirements and recommend the best possible product. 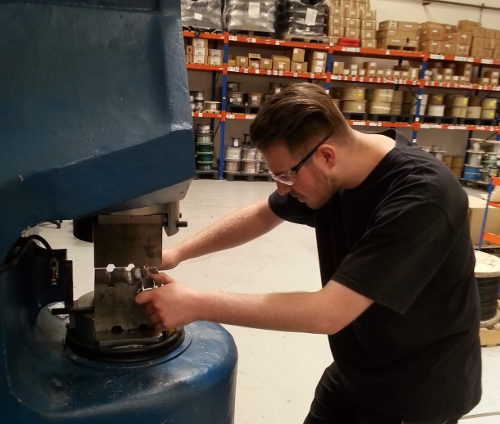 Our fully trained Production Operatives pride themselves on their attention to detail and care given to each manufactured assembly to ensure they are manufactured exactly as specified. A detailed manufacture procedure is written for every wire rope assembly manufactured to ensure every one is exactly the same for that and any subsequent orders.